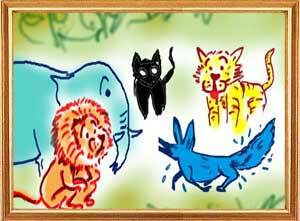 Chandaraka was a jackal living in a forest. One day, driven by hunger, he came to a nearby town in search of food. Seeing him, a group of mongrels began chasing and attacking him whenever possible. 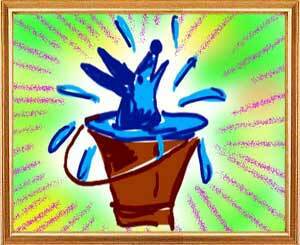 The jackal fled in panic and entering the house of a washer man hid in a vat full of blue used for bleaching clothes. When he came out, he became a blue animal. Thinking that he was not the jackal they chased, the mongrels dispersed. All the animals in the jungle accepted him as the king. He in turn appointed the lion as his minister, the tiger as his chamberlain and the wolf as the gatekeeper. After distributing office to the animals, the new king Kakudruma banished all the jackals in the forest. The lions, tigers and the wolves killed other animals and brought them as food for the king. Taking his share, Kakudruma would distribute the rest of the kill among his subjects. 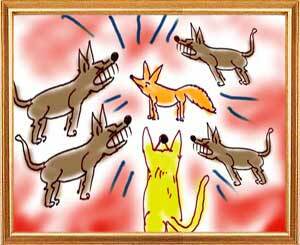 One day when the blue jackal was holding court, he heard a gang of jackals howling. Thrilled by the sound of his own ilk,Kakudruma began loudly responding in his natural voice. The lions and other animals immediately recognized that their king was after all a jackal and not a Godsend. They at once pounced on the blue jackal and killed him. “But how do I believe that Sanjeevaka has evil intentions,” asked Pingalaka. “He told me today that he would kill you tomorrow. If you notice him carefully tomorrow, you will find him red-eyed and occupying a seat he does not deserve. He would stare at you angrily. If what I say comes true, it is for you what to do with Pingalaka,” said Damanaka. “Your are right, sir. But where is rest for servants. They have lost their freedom for the sake of money. They know no sleep, no interest in food nor can they speak without fear. Yet they live. Somebody has rightly compared service to a dog's life,” said Damanaka. “Come to the point, my friend” The bullock was now impatient. Damanaka said, “Sir, a minister is not supposed to give bad advice. He cannot also disclose state secrets. If he does, he will go to hell after his death. But in the cause of your friendship, I have revealed a secret. It is on my suggestion that you have taken up service in the royal household. Pingalaka has evil designs against you. When we were alone, he told me he would kill you and bring happiness to everyone in the palace. “Sounds interesting. Let me know what happened to the camel,” asked Damanaka. Sanjeevaka began to tell him the story.